Published: Jan. 9, 2016 at 12:00 p.m. Updated: Jan. 9, 2016 at 04:02 p.m. While six other teams continue to search for new leadership, Miami has fallen for Adam Gase. The Dolphins on Saturday made the Bears offensive play-caller their new head coach, the team announced. NFL Media Insider Ian Rapoport reported that Gase has signed a five-year deal, per a source with knowledge of the situation. During Gase's introductory news conference, the Dolphins announced he will have full control of the team's 53-man roster. In addition, Gase said he will call plays on offense. With Gase's hiring, the Dolphins are expected to pursue Bengals defensive backs coach Vance Joseph for their defensive coordinator, Rapoport reported. "It's going to start with the right people," Gase said. "It starts with the players, it also starts up top and we think we have the people in place who have the passion, the work ethic and unselfishness we need to compete and be a winning organization. "We are looking for guys who want to invest in winning," Gase continued. "It's going to be critical that guys come in here day in and day out and understand that's what we want." Gase was one of the hottest names on the market after his promising handiwork with Bears quarterback Jay Cutler, who threw just 11 interceptions this season after 18 picks in 2014. Chicago's offense was an up-and-down affair, but Cutler's career-high 92.3 passer rating only helped Gase's reputation as a quarterback whisperer. Gase also did fine work developing rookie running back Jeremy Langford for a Chicago offense that was hamstrung all year long by injuries to wideouts Alshon Jeffery and first-round pass-catcher Kevin White. "We did exhaustive research on all of the candidates ahead of time and conducted thorough and detailed interviews with each person," Dolphins owner Stephen Ross said in a statement. "In the end, I was convinced and the search committee was unanimous Adam was the right leader for our football team who best met all of our priorities. He has high-energy is competitive and driven to win with a mindset of teaching and developing players." Gase has been talked about as head-coaching material since helping guide Peyton Manning and the Broncos to Super Bowl XLVIII. 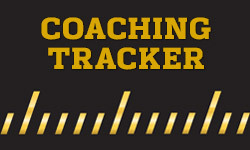 During his two seasons as Denver's coordinator from 2013 to 2014, the creative play-caller directed an attack that led the NFL in points, total yards and passing yards per game. In Miami, his task is clear: fix the play of Ryan Tannehill. The Dolphins passer was on the rise before a troubling season in 2015. Tannehill met with Gase during the interview process, as did defensive behemoth Ndamukong Suh. The Dolphins fired coach Joe Philbin following an early-season loss in London to the Bills. Interim coach Dan Campbell took over and performed well enough to net an interview for the gig, but Dolphins football czar Mike Tannenbaum made it clear this week that he and newly anointed general manager Chris Grier planned to spread a wide net to find their man. Forget the wide net. Miami went fishing and found their guy in a hurry.